Recently we were going through tapes we have from the early to mid 90’s and have been updating our YouTube Channel with videos ranging from The Brothers Cazimero to Kealiʻi Reichel. One of the more interesting finds was this video Jon de Mello created for IZ’s iconic song “E Ala E“. This video contains the only Live Performance footage de mello has of IZ performing. He was playing at the Waikiki Shell and de Mello went into the pit with a HI-8 video camera and filmed IZ perform this song. He created this video in 1995 when Israel was still alive and it has never before been seen until now. Love this man, feeling the music. I was amazed as I listened to Iz on the soundtrack of a Brad Pitt movie!! It’s good to know Hawaiian music is not and cannot be forgotten!! Mahalo from a one-time islander stranded in Jacksonville, FL. I just love his spirit and voice so much, really wish I could have met this man. A blend of rich soul and fluent expression. How can you not want more? Incredible find. His is a voice that shall not die. An incredible song, an incredible man; thank you for this gem. Estatic to see a new video version of E Ala E.. IZ message of Native rights is stiil heard strong across the world. Bruddah IZ voice will live forever!! It is a strong & beautiful song! I love IZ! My husband is from Hawaii & we have a daughter that I hope will embrace the Hawaiian people & the beauty of such an amazing place. Thank you to all of you that continue to share IZ’s music with us! Beautiful music, beautiful man. His voice shall be heard forver. Thank you for this. Sehr inspirierende und beruhigende Musik. Ein sehr großer Künstler. everytime i hear this song i cry, there is something about Iz’s voice that touches the soul….. RIP braddah……. Dios te bendiga… fuiste grande y lo sigues siendo… gracias por tus melodias!!! The heart he have is bigger then his great music, all the world lost a brother..
I’ve found you, my brother. I’ve got it now, so now you have it too. Now we can feel the love of the people who loves us. Very deep inside us. I’ve seen you as a big cloud over me, and you’ve rained over me with your love. Now we can rain together our love all trough the world. Let’s keep on singing! I can see you in my dreams, and when I talk to the mountains. I would like to have met you before, but I don’t mind, because now you come to me to feed my soul. And now, I’ve found you, and I will hear the voice you had your last time at every moment I choose. God bless the people who enjoyed your presence when you were alive in your last body. You’re alive anyway. Keep on taking good care of your people. Aloha, friends in Hawaii! Can someone please give me a translation of E Ala E? I have gone to several sites and they want to download onto your machine and some don’t even have the song. I am no longer lost, but found in your lyrics. Thank you brother. i will continue from here. Aloha, from Canada! I am a schoolteacher who has recently started a Ukulele club because it is such a cool instrument and the youngsters LOVE it. 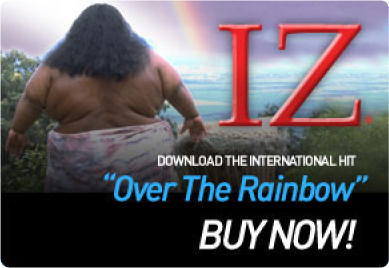 So, of course I’m looking for inspiration and I come across IZ. I don’t know if it’s the kindness in his face, or the joy of his music…..perhaps the jaw-dropping talent and passion. Whatever it may be…..there is a new generation that loves this guy! You cannot describe perfection, but you can listen to it. In this video. Mahalo from one of those Iz called “Hawaiian at heart”.